Triple dog kudos to Eric Rachner for pointing out this story to me. The word around town was that the Hummers weren't moving. It looked like high gas prices and a White House reversal on fuel conservation meant that fewer "W" bumper stickers would find their exposed sticky sides mating gloriously with the smooth rear bumper of an H2, somewhere between the tow loop and the access hole for a Class 3 hitch. We were skeptical at first. Sources can be unreliable, but the scuttlebutt was that inventory had been building for months now and the local Hummer dealer had panicked. 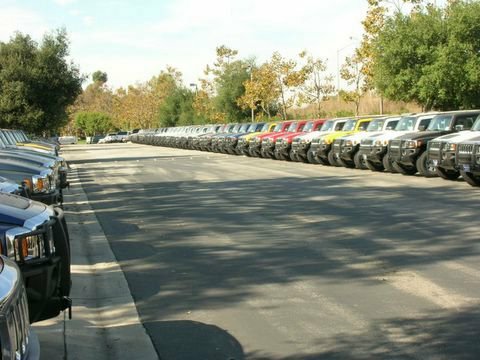 He had begun storing his Hummer inventory at an undisclosed location, far from the dealer showroom so as not to spook jittery, prospective buyers with the mounting number of unsold H2s and H3s. When an anonymous caller phoned in with the location, we were off. "The rear parking lot of the Hyatt Westlake Plaza Hotel", he said, just before the line went dead. Well -- seems as real as anything I link to! But I didn't check the lot myself. I live in Seattle. Ah, then what a good job on the shadows, the moon shot pictures looked cheapjack in comparison.